Feel safe knowing we are accredited, licensed and insured and have offices in Miami and Dade County, Fort Lauderdale and Broward County and West Palm Beach, Coral Springs and Pompano Beach Near Palm Beach County or we travel to you. This is the American Heart Association (AHA) Heartsaver CPR and AED Class (this heartsaver cpr aed course is not for healthcare professionals..that specific course is called "healthcare provider bls" which costs $80). Learn how to recognize the symptoms of a SCA, Stroke, Heart Attack and how to do Layperson CPR (for adults, children, and infants), heimlich maneuver (choking), hands only cpr, compression only cpr and rescue breathing. 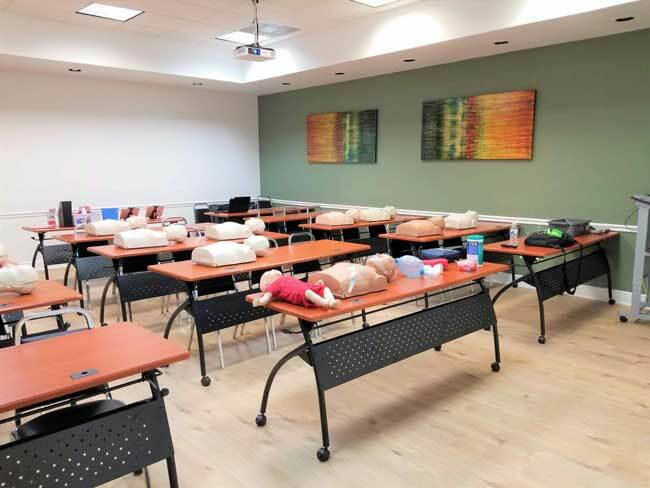 In addition, in all classes, we will teach you how to use an Automated External Defibrillator (AED) for victims of sudden cardiac arrest. These important devices are becoming available in more and more public places, such as airports, hotels, schools, and health clubs. Visit our AED Store to purchase your own HeartStart Defibrillator. Gain confidence in your ability to handle medical emergencies. This first aid portion of the course provides skills in first aid emergencies such as bleeding, allergic reactions, use of epi pen, heat illness, sprains, strains, glove use and removal, burns, seizures, and fractures along with accident prevention. The class also meets OSHA standards for childcare providers, daycare centers, coaches, after care workers, construction workers, counselors, etc. Training book included at class if you do not have one. Childcare providers, daycare centers, teachers, coaches, personal trainers, after care workers, some hhc, construction workers, counselors, (this class is not for healthcare professionals...that is called BLS). I am going to be a nurse, emt or firefighter...is this the class I need? NO! You need the Healthcare Provider BLS class, that is $80. Do I have to pay online for all classes? Your choice. You can pay online through our website or just pay by cash or check when you arrive. Am I supposed to have my own AHA book? Yes. If you forget or don't have one review at www.cprflorida.net/cprreview we also have them at class. Do I have to do AED (defibrillator) with CPR? Each class is not exact (number of students, location,etc) so approx. times are: cpr and aed is about 2.5 to 3 hours. CPR, aed and first aid is approx. 4 or more hours. Do you do free classes? No, we are a busines and this takes time, energy and we have to pay for business supplies and for our instructors time off of work. There are a lot of "free" classes that are not truly free or a scam or just are online. Chose us for a class and training that can not be beat! Take a real class with us and you will learn to be a true lifesaver!